Our Credentials| Intruder Detection Systems Inc.
Certified in Three States as an Alarm Contractor. 17 Year Active Designated Expert Instructor - New York City Police Department, the Nations Leader in Law Enforcement-. Instructor to the Alarm, Security, and Law Enforcement Communities. Court Qualified Forensic Alarm and Security Expert. Certified Protection Professional- ASIS International. Board Certified in Security Management- ASIS International. NICET IV Certified Senior Engineering Technician in Fire Protection Engineering Technology/Fire Alarm Systems-National Institute for Certification In Engineering Technologies- A Division of the National Society of Professional Engineers. Formerly Appointed as a Special Expert (SE), by the National Fire Protection Association to Serve as a Principal Technical Committee Panel Member for NFPA 72 of the National Fire Alarm Code, and for NFPA 72 of the National Fire Alarm and Signaling Code. Appointed to Serve on Twenty (22) Two Underwriters Laboratories, Inc. Standard Technical Panels (STP). 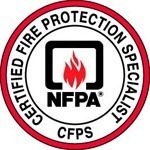 Certified Fire Protection Specialist, National Fire Protection Association International. Certified In Homeland Security Level IV, Certified by the American College of Forensic Examiners International. Certified Criminal Investigator, Certified by the American College of Forensic Examiners International. Fellow-American Board of Forensic Engineering and Technology (FACFEI), Certified by the American College of Forensic Examiners International. Author of the Peer Reviewed Forensic Treatise The Alarm Science Manual™. Author, Developer of Curriculum, and Instructor of Forty (40) Certified Continuing Education Courses for Licensed Alarm Contractors in the State of New Jersey. Author, Developer of Curriculum, Faculty and Instructor of Educational and Technical Courses for the Electronic Security Association (ESA). Monthly Technical Contributor and Writer in Security Science for the Nationally Recognized and Peer Reviewed Security Sales and Integration Magazine. College and University Instructor for Undergraduate and Graduate Students to Institutions of Higher Education and Learning, in Alarm Science, Advanced Electronic and Physical Security Countermeasures, Crime Prevention Through Environmental Design (CPTED), Security Surveys, Needs Analysis, Security Systems, Access Control, CCTV Video Surveillance Systems, Physical Security, Fire Alarm and Life Safety Systems. New Jersey Electronic Security Association. National Fire Protection Association International. American Society for Industrial Security International. American Society of Certified Engineering Technicians. International Association of Electrical Inspectors. Metropolitan Burglar and Fire Alarm Association. National Institute for Certification in Engineering Technologies, a Division of the National Society for Professional Engineers. American College of Forensic Examiners International. All services provided by Intruder Detection Systems, Inc. are subject to the terms, conditions, and limitations of our installation and monitoring contract. All certifications and/or licenses in the State of Florida are in an inactive status.